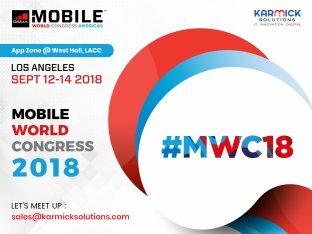 Karmick Solutions is exhibiting in the upcoming Mobile World Congress (MWC) to be held in Los Angeles from 12th to 14th September in 2018. We will have a booth in the App zone in West Hall of the Los Angeles Convention Center (LACC) in California. We would like to invite you all to visit our booth and share your requirements with us. Please give us a call or drop an email at sales@karmicksolutions.com.